Woo hoo! My box of goodies from the new catalog arrived last night! I haven't had a chance to go through everything, but tonight's the big night. I'm so excited to get playing with my new stuff! I LOVE new catalog time!!! I can't wait to show you what I come up with! 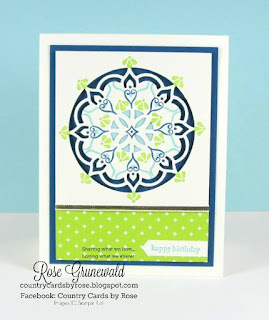 In the meantime, I've got a tutorial for you for a gorgeous card using the Eastern Beauty bundle! 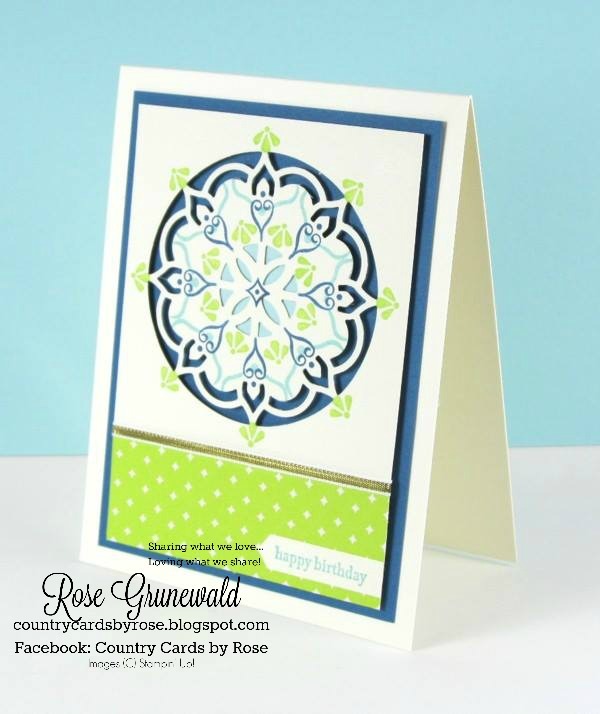 My friend Barb made this card, and I love the bright colors, so I just had to share with you! 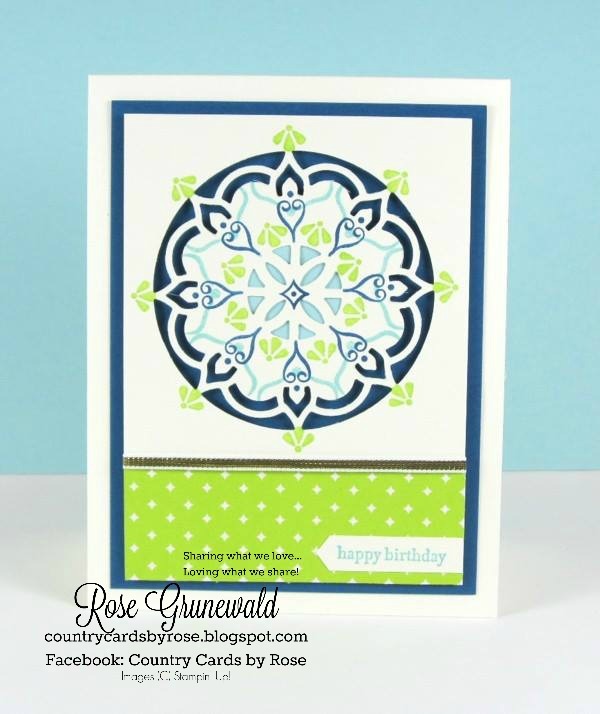 Don't you just love how she stamped that peek-through medallion? Dapper Denim Cardstock- 33/4" x 5"
Pool Party Cardstock - 1" x 1"
1/8" Gold Ribbon - 6"
Crop the large circle shaped medallion from the top center of the Very Vanilla layer. Stamp images where shown, border image in Pool Party, small partial flower in Lemon Lime Twist and the small square with dot and small heart shape in Dapper Denim. 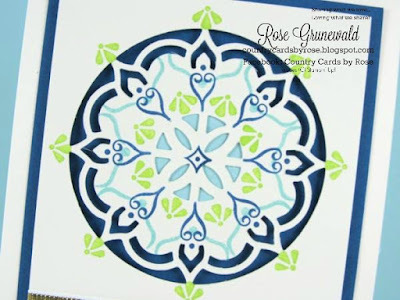 Add the strip of Lemon Lime Twist DSP to the bottom and add the small square of Pool Party to the back in the center of the medallion. Wrap the ribbon around the seam of the DSP and secure to the back with SNAIL. 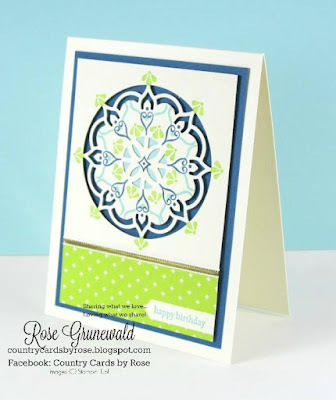 Add this layer to the Dapper Denim layer with Stampin' Dimensionals. Stamp greeting on the scrap of Very Vanilla in Pool Party ink and crop with the Classic Label Punch, snip off right edge and add to card where shown.